It is believed that the first traction trebuchets were used in China as early as in the 5th century BC. About a century later they were seen in the Byzantium, an ancient Greek city. Many believe the trebuchet came about from the ancient use of slings. Slings were a common weapon used by many in ancient times. A variation of the sling was created which contained a short piece of wood, extending the arm of the sling to give better leverage. The first trebuchet was called a traction trebuchet where a number of people pulled on ropes attached to the short arm of a lever while the sling was on the other end, as depicted above. 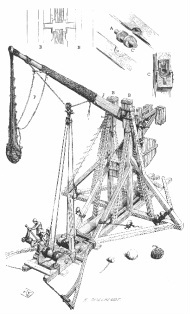 Around 1300 AD trebuchets developed as a major part of warfare, superseding the catapult. This preference for the trebuchet was due to the fact that it was able to cast stones of 300 lbs which was much greater than what catapults were capable of. Trebuchets were used against fortresses as they were capable of hurling a great amount of weight, destroying walls and buildings in its way. Despite the use of gunpowder, trebuchets were continually used up through the 15 century as they were still very effective against opposing forces. Traction trebuchets used manual force on the short end of a lever arm to launch the long end of the lever arm with a sling over. Small scale versions required only one operator, while they were used on large scale with 20-45 people pulling. The counterweight trebuchet uses weight instead of manual power to hurl the object thrown. This allows great power, using large stones and other materials in medieval times. These are the most common form of trebuchet. Average mass of projectiles was likely around 50-100 kg and could shoot about 300 meters far! Information and images from wikipedia.com.